At first it doesn't feel quite right. I'm sat in the back garden collecting a bit of sunburn and I have Yucatan's new EP, Enlli, on my mp3 player. It's humid, I'm cursing the Viking genes that make me want to run and hide in dark places whenever the sun shines like this; I'm cheesed off; moist for all the wrong reasons; a bloody wasp is buzzing round my head. I'm almost Buddhist in my respect for nearly all other living creatures; but wasps: I'd gladly genocide every single one of them. In short, I'm in a bad mood. There are numerous reasons for this, but after a month immersing myself in the DVD boxed set of Band Of Brothers and ruminating on my Grandad's time as a paratrooper, it feels all wrong to moan about the piffling, snivelling trials in my own life. But perspective can be a disabling thing. So, hot and stultified by inappropriate angst I'm thinking about retreating to the shade of the kitchen where the washing up needs to be done and there are a bunch of bills I need to pay and cracks in the wall I'm supposed to have called the builder about and clumps of hair from our ancient cat that's breaking all moulting world records and... and... oooh... god, that's beautiful. The delicate carousels of the guitar in the Enlli EP's lead track, Cur, hung on a firmament of piano notes as clear as stars in a cloudless sky, pick me up and elevate me out of the smouldering back garden, lifting me above the treetops so gently I hardly notice the lawn I was supposed to have mown yesterday evening. I can feel a breeze on my face, but it's not coming from the weather: it's the breaths of the choir that splendidly billows out the sails of the first two tracks on this EP... somewhere in amongst the ice sparkles of glockenspiel and Dilwyn's lonely voice. Dilwyn is Mr Yucatan, if Roger Hargreaves had ever thought to write a book about a humble sonic explorer. And I swear to you: I feel cool, liberated, blown far away from the inconsequential chaff by the beautiful visions landscaped to perfection on this EP. If it doesn't remind you of Sigur Rós' atmospherics you're being deliberately contrary. Sigur Ros' music is inspired by the Icelandic land and skyscapes. Over recent years their music has lost some of its evocative power because TV producers have bled their albums dry to bring celestial beauty and drama to snake oil TV shows that are as mysterious as con men fleecing pensioners. And Sigur Rós' unwitting (and, I believe, unwilling) omnipresence on Saturday evening ITV has weighed these once otherwordly tracks down with humdrum associations. Back to Yucatan. In exactly the same way that the strange landscapes of Iceland permeate Sigur Rós' music, so does the dramatic geography and meteorology of Wales shape Enlli. Particularly, this EP is inspired by the 'evocative mystique' of Ynys Enlli, off the West coast peninsula of Pen Llyn. And although the approach is similar, in some respects, to Sigur Rós: minimal orchestration, echoey grandeur, a sound to fill a night sky with bright wonders, this EP is as unique as the landscape that inspired it: no more similar to Sigur Rós than a photo of Ynys Enlli is to a photo of some weird volcanic moonscape on Iceland. In particular, Dilwyn's voice is more grounded, less ethereal than Jonsi's. He sounds like a man awed by what he sees around him - which is resonant to me as a listener because throughout this EP I'm awed by what I'm hearing. It's breathtaking, emotive and suffused with enough magic to turn a bad afternoon into one illuminated by marvels. I'm just about ready to face that washing up, now. 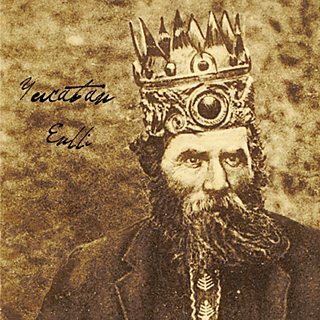 Enlli is released on Recordiau Coll on 23 August.